« Skyrim: Fallout mini-review with tips and tricks! 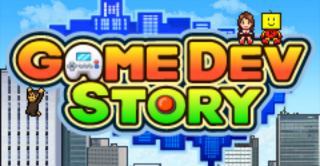 As the title of the game goes, Game Dev Story is pretty much what it sets out to be, minus the story. There is no story script per say but the game does contain rpg elements which I’ll talk about later. The story is more of an adventure: you create the story yourself by giving your company a name, hire the staff you like and create just about any combination of games that you can discover. Octo and the Newbs admins cranking out a new server and map rotation. Like any good company, you have to have a plan. You can’t just throw your money into anything and expect to make money. Contracts will be your bread and butter at first as you’ll need it to fund your games, hire new employees and pay their salaries. It also generates research points that are used for other things. So make sure you stock up, as you will need plenty to give your company a good chance to succeed early. These contracts are simple, leave little room for error and take the least amount of time to complete. Just ensure you don’t accept tasks that may be too much for your rookie staff. 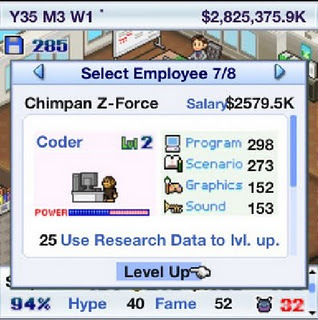 As an rpg fan, I really got a kick out of the stats and roles each employee has. Coders are best at programming (an all-around good skill to have),Writers with the Scenario (story and style baby!) Designers with graphics (you want it to look good right? ), Sound Engineers with Sound (Hire Daft Punk imo) and Writers for game proposals (which are a necessity if you want to begin making ANY game). Stats can be increased through training and levelling aka promotions, but that can put a hole in your pocket as their yearly salaries will rise with their level. At the same time, new game genres, types and roles can be unlocked by training, i.e. 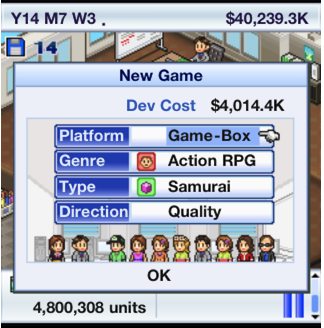 : Lv3 Producer unlocks Action RPG genre and making a Writer “train” by watching movies unlocks the Samurai type game. It is highly recommended you play around with the training options. Not counting the starting game options, there is 15 genres and 68 types of games you can unlock. 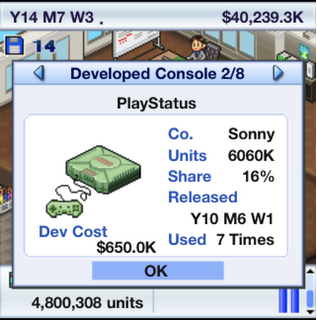 As you progress and use more expensive methods of hiring, you will find people who’ll have high marks in more than one skill and have several jobs under their belt, ie: a Director is good at coding and writing and the Hardware Engineer which is needed if you ever want to create your own console. Speaking of genres and types, combining them rightly together is where the real fun begins. 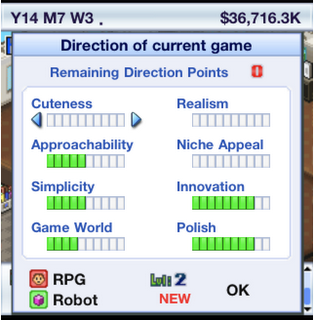 Use enjoyable examples of games like Action + Rpg or Romance + Simulation. You can try more unusual combinations but the game lets you know if you’ve picked an odd one. Tons of selections to unlock and chose from! Though some logical combinations don't always work. Think Japanese games. As any good video game company knows, fans are important and there are various age groups. Depending on what type and the popularity of the games you make, you will gain fans of a certain age group. As your company ages, so will your fans. Be sure to think ahead so you’ll always have lots of people buying your games. Throwing money into various types of advertising helps attract particular groups and helps future sales. Psh! Skyrim's line was much longer. Now here’s a description on how things work when making a game. Skip this paragraph if you want to figure it out yourself. First, pay a one-time fee for a licence on the console you want to work with. Two, pick a genre and type. The popularity of them plus the choice of console determines the starting cost. 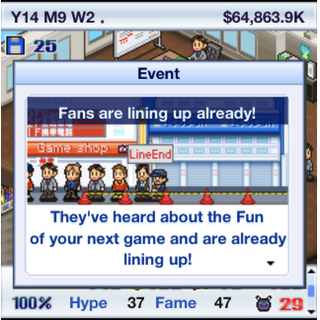 The more experienced you are in these areas also lets you allocate points in which direction you want the game to go in which can affect the type of fans you attract. Thirdly, they’ll prompt you to pick someone to write the game proposal, graphics, sound and fun. Pick whomever you feel would be the best, some are obvious and some aren’t, though be mindful that picking the same person who did the previous game might suffer a penalty. Taking chances can pay off or create bugs in your game which will take more time at the debugging phase. Randomly during the creation phase, your staff will make a proposal, for a price, to boost a random stat (Fun, Creativity, Graphics or Sound). The success rate depends on their skill and how many research points you invest in it. Advertising, fans, fame, hype and high points during the creation phase are factors that determine your sales and success of the game. Lastly, the game is thrown to the wolves aka the reviewers. They will give you scores which will boost your sales (sorry, there’s no option to lavish them with free stuff in order to get a better score lol). If you score well, that particular game will be placed in the Hall of Fame. You’re now allowed to make a sequel of it which generally creates an instant best-seller. It's important to know what kind of gaming you're making and not to spread out the points too much. The game doesn’t stop there, oh no. To make things harder and more exciting for you, you have competition from other companies. Don’t dismay from not doing as well in the first few years, especially at the annual award show. Be smart with your capital, even if you really want to hire that “celebrity” during the games own version of E3. Set your some goals, save your money for the write game and hire the best staff with high marks in their specific fields as it will all help with making better games and win. Now down to the hilarity or should I say punnery? The game is full of puns and inside jokes, from character names like Lady GooGoo and Gilly Bates, to company names like Nintendro and Campcon and consoles like Play Kid and Microx 480. Just about every name is based off of people and things related to the industry or their craft. God knows the silly, profane and awesome ones you come up with as you’re allowed to name your company, games and consoles you create. Also known as the green stoner box 420 edition. Overall this game kept me glued to my phone for longer than any time wasting app I’ve had. I laughed at the terrible names, I cursed at my opponents for doing better than me, grumbled as my employees botch proposals and fist pumped like a frat boy as I watch my sales go through the roof. Honestly for any self-respecting gamer out there looking for a good game to play on their iPhone (Android support is underway), get this game asap. It’s well worth it. *side note, The first Game Dev Story actually dates back to 1996, while its sequel debuted on PC roughly10 years ago. 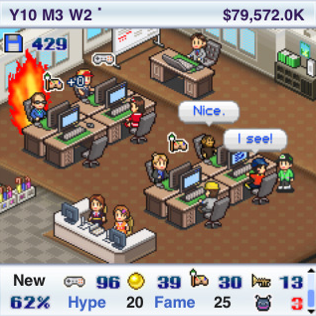 The company Kairosoft is a Japanese game company that has made several simulation games already, so far about half a dozen exist on both the iPhone and Android with one or two exclusives, so if you enjoyed this one then keep an eye out for others. I personally like the looks of the sushi restaurant and cruise ship sims. This entry was posted on Monday, December 5th, 2011 at 4:37 pm	and is filed under Review. You can follow any responses to this entry through the RSS 2.0 feed. You can leave a response, or trackback from your own site. Yeah dude, this game kept me glued to my phone for hours on end..
Until I realized that toward the end of the 20 year cycle, it’s impossible to fail. I had hardware designers, hackers, etc, stats completely maxed out. And then the play new game+ when you beat it, hoo… I was winning first place in the award shows my first year. Great game overall.